#perfectbrows If you're like me and most other women, you're not satisfied with your eyebrows. As we age the eyebrows tend to become thinner and even sparse in spots, or have been severely plucked for years. I recently received a product to try out that works really well for just that scenario. 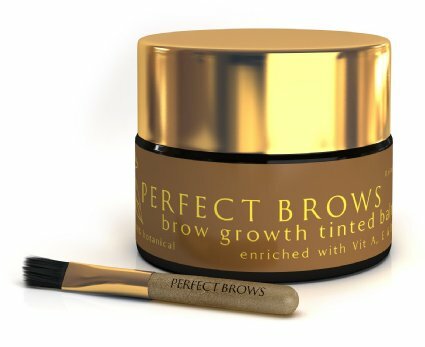 Perfect Brows is a balm pomade that makes your brows look shiny and well groomed while being treated.It's tinted a chocolate brown color which works great for filling in and making your brows look fuller. New hair growth can take some time especially in the severely plucked situation, but this 100% botanical pomade nourishes the follicles to allow new hair growth to begin while keeping your brows looking their best. This product doesn't make your brows feel greasy or heavy, just conditioned and healthy and shiny. I never really paid much attention to my brows until now, and I have to say I look much more put together.I never realized how much difference well groomed eyebrows made. There are no chemicals or hormones in this product. Saw Palmetto Oil , Cucumber Seed Oil , Rose Hip Oil , and Coconut Oil keep your skin smooth and hydrated . Beeswax keeps new growth growing in the right direction. Great product!